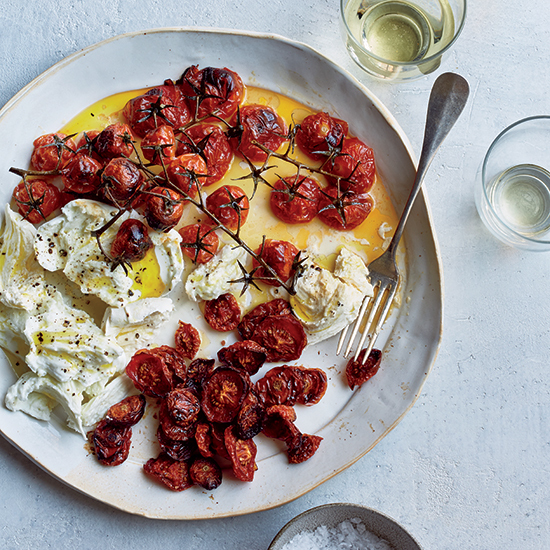 Let tomatoes be the star this month. Here are five simple recipes to make with peak-season tomatoes. When tomatoes are at their peak, they should be eaten for every meal. The juicy, peak-season fruits are sweet enough to bite into like an apple, but they’re also an instant upgrade to any dish. To show our adoration, here are five of our favorite simple late-summer recipes that are all about the tomatoes. This insanely easy tomato sauce from F&W’s own Mad Genius, Justin Chapple, should be in everyone’s summer repertoire. Simply shred your juiciest tomato on a box grater and mix with a little olive oil, salt and pepper. This versatile tip is also great for making tomato vinaigrette: just up the olive oil and add a little red wine vinegar and grated garlic. We love the clean flavor of celery with sweet summer tomatoes. Here, a little minced chile is added for heat. Serve the salad on its own or with grilled meat, as we did in this recipe. This summer starter channels Italian simplicity. Cherry tomatoes are prepared two ways: roasted and semi-dehydrated. Arrange on a platter with creamy buffalo mozzarella and finish with a hearty drizzle of quality olive oil. Make sure to have lots of good bread to serve with this one. In the summer, the grill is really all you need. Wrap cherry tomatoes in a packet of foil and grill until they burst. Mound on grilled, garlicky ciabiatta with all of those sweet juices and top with basil. This dish is best enjoyed outside with a crostini in one hand and a crisp glass of rosé in the other.